The R4 Rural Resilience Initiative (R4) is a strategic partnership between Oxfam America (OA) and the United Nations World Food Programme (WFP). The initiative combines improved resource management (risk reduction), insurance (risk transfer), livelihoods diversification and microcredit (prudent risk taking), and savings (risk reserves). In Kenya’s Arid and Semi-Arid Lands (ASALs), a 2015 feasibility study set the basis to conduct a dry run for the 2016 short rain season (October – December) in five sub-counties of Kitui – Kitui Rural, Kitui East, Kitui South, Mwingi Central and Mwingi North. Two types of index insurances were tested: Area Yield Index, where regional yield indices are derived from Crop Cutting Experiments (CCE) and a Weather Index based approach. Based on the dry run, it was selected to proceed with the Area Yield approach as it is easier for partners and participants to understand, accept and actively engage in the process. Technical and operational challenges and key lessons learnt during the dry run phase provided a critical input into the strategic planning and design of the scale up phase. In 2017 long rains, 963 participants (90 percent women) in one ward of Kitui accessed area yield index insurance coverage for four drought tolerant crops – cow peas, green grams, millet and sorghum, under the risk transfer component of the initiative. This was then expanded to 4,752 participants across Kitui East, Rural and South during the 2017 short rains. Plans are currently in place to roll out insurance to 10,000 farmers in 2018. To optimize the planning of Crop Cutting Experiments (CCE), it is important to have information on where what grows and the crop stage of development. 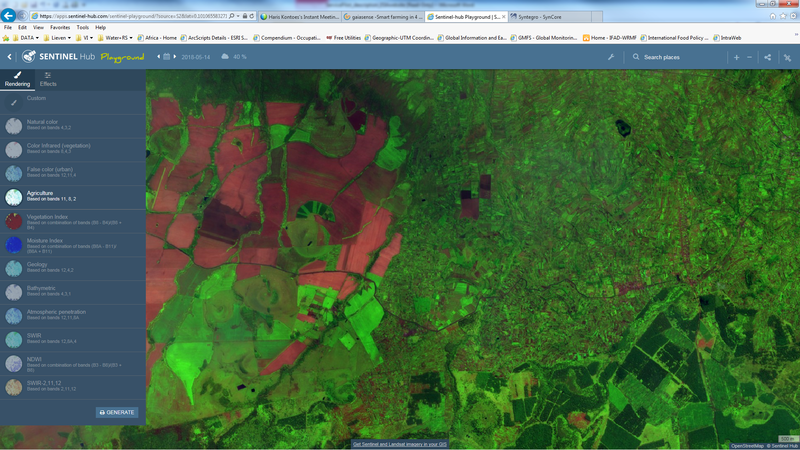 In this TEP-Food Security pilot, Sentinel 2 imagery will be used to demonstrate its capabilities in identifying agricultural fields and to extract information on the crop’s phenology. 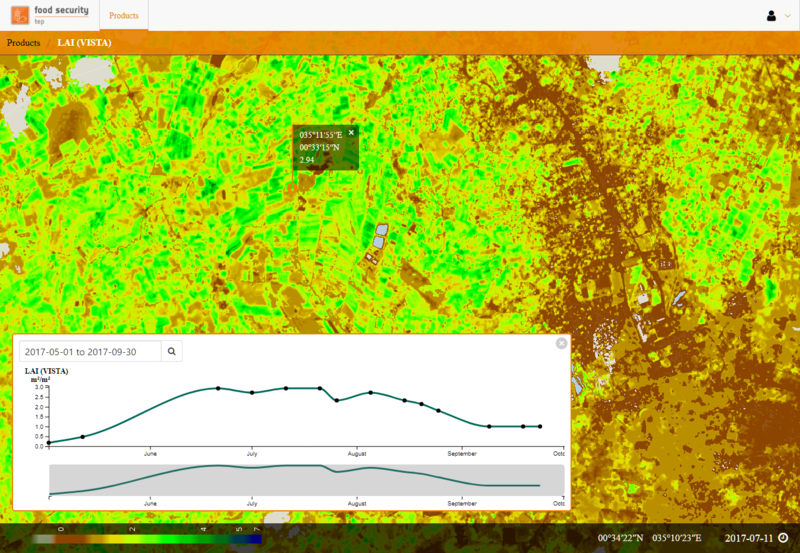 The Sentinel 2 data is processed from level 1C till level 2A derived biophysical parameters via the TEP Food Security platform. A processing chain is embedded that uses iCOR for atmospheric corrections, SEN2COR for cloud/shadow masking and the BIOPAR (as in the SNAP toolbox) for the retrieval of biophysical parameters. These basic data are further treated with techniques to identify and extract agricultural fields. 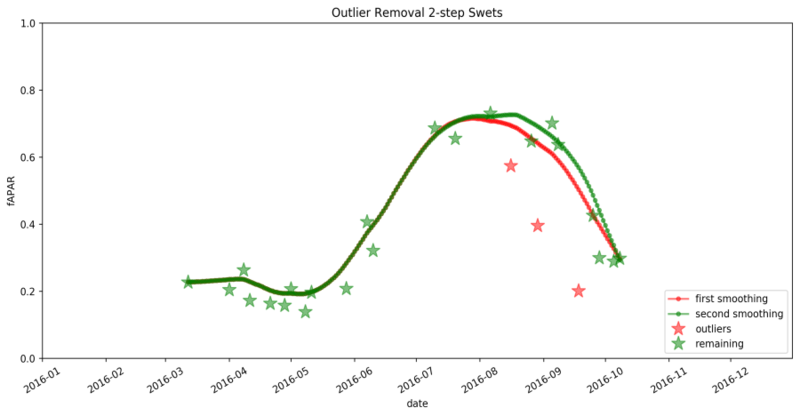 Time series of biophysical parameters are extracted at the parcel level, gap-filled and smoothed to estimate the crop’s growing stage. The second part of Service pilot 2 is a test case that brings together a local African company that provide micro credits to farmers with the Global Smart Farm concept using the Food Security TEP. FarmDrive, a local company from Kenya has been founded with the explicit goal to leverage technology to enable smallholder farmers (SHFs) in Africa to achieve self-sustenance. 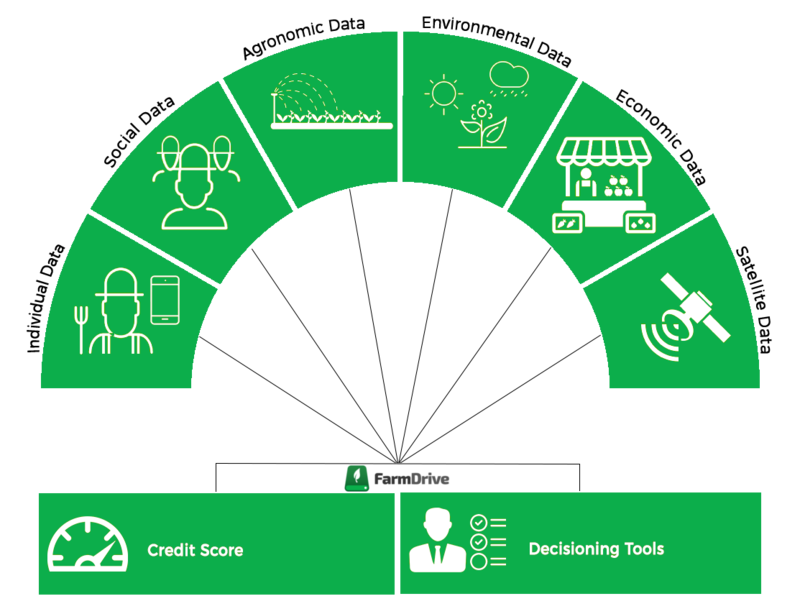 FarmDrive expands access to credit to underserved smallholder farmers by providing modern tech-driven credit assessment tools. Presently, the FarmDrive mobile loan service does not make use of EO data. However, in order to access the risk and performance of agricultural loans, crop and soil monitoring throughout the crop growth cycle could be crucial. EO information will be used to monitor agricultural crops at the regional scale, which will assist in improving FarmDrive credit scoring and loan repayments as well as managing FarmDrive portfolio risk. Various vegetation indices (VIs) from several satellite sensors have already been explored in crop condition monitoring, crop acreage estimates, crop yield forecasting and crop modelling at regional and national scales. The Normalized Difference Vegetation Index (NDVI), based on the contrast between the maximum absorption in the red portion and the maximum reflection in the near-infrared portion of the electromagnetic spectrum has been widely utilized for crop monitoring and agricultural statistics. Yet, NDVI has some limitations in predicting the biomass especially of dense vegetation, as reported in a number of studies. Hence, to monitor crop development and surface soil moisture, EO leaf area and soil moisture products will be provided on Food Security TEP. An additional Customized Service will provide time series of crop yield estimates and crop development for regions defined by the FarmDrive geolocation algorithm. Based on the continuous EO crop and soil observations, the regional crop yield estimates as well as their own repayment data, FarmDrive aims at building a predictive crop yield model to assess their portfolio risk. The validation of the predictive model will be conducted and reported by FarmDrive based on their loan repayment data and available farm data of the Digifarm project, a mobile phone solution developed by Safaricom, Kenya and partners. As a result, the continuous monitoring of crop development and drought risk in near-real time will enhance the continuous assessment of the portfolio risk of FarmDrive’s loans.